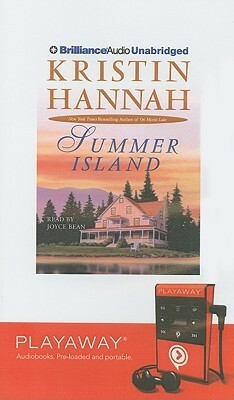 Summer Island By Kristin Hannah……….Entertaining and Though Provoking! Nora Bridge was famous. She had her own talk show and advice column. On the outside she had it all together, but nothing could be further from the truth. Years earlier, Nora had walked away from her husband and daughters Ruby and Caroline.Nora’s relationship with Carolyn was strained and her relationship with her youngest child Ruby was non-existent. Ruby,a struggling comedienne wanted nothing to do with her mother.That is, until the Nora Bridge scandal broke out and Ruby was offered the opportunity to cash in on it and tell all. And then Nora was injured in an accident, and needed someone to help care for her. Ruby was the obvious choice as she had no husband, job or children to hold her back. For once things seemed to be falling into place for her. Finally Ruby could get back at the mother who had abandoned her years before and make money in the process. But things are never as they seem and the more time Ruby spent with her mother at the family home on Summer Island, the more she realized how little she actually knew about her mother and the events leading up to her leaving their family. Together Nora, Ruby and finally Caroline revisit the demons of their past. Summer Island was a thoughtful account of one families struggle to deal with the past and create a healthy future.Once more Kristin Hannah has written a touching story and one with a wonderful message about love, family and forgiveness. We all make mistakes and although it may not be possible to change the past, take back the ugly words we spouted at someone we love or unring a bell, it is possible to make amends and move on. But first we have to learn to not only forgive others, but forgive ourselves. Sometimes a book just gets to you. Summer Island sure got to me! Haven’t heard of this Author. Sounds like an interesting story! Glad that the mother and daughter were able to reconnect, and that the daughter didn’t seek revenge as she originally planned. Sounds like a nice, “happily ever after”. 🙂 Those are nice to read. Hi April! There is so much more to this novel than I revealed…..an ex love, a dying friend etc. I have read and enjoyed many of Kristin Hannah’s books. They are quick,easy reads yet often emotional, thoughtful story lines.